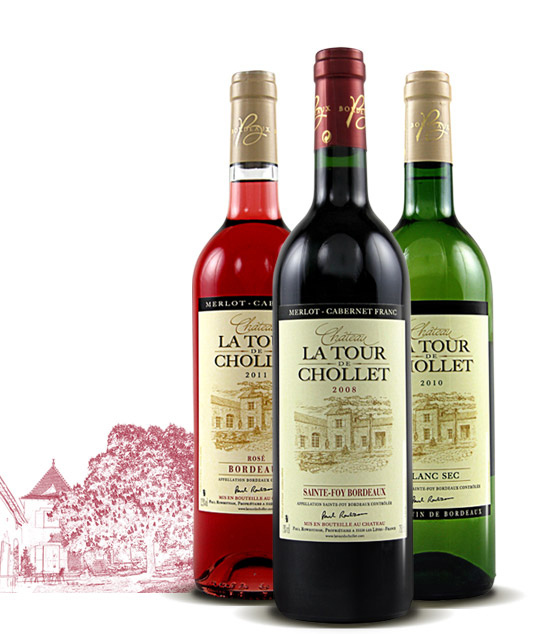 Welcome to Chateau La Tour de Chollet, a family run, award winning organic vineyard located in the beautiful rolling countryside near the ancient bastide town of Sainte Foy La Grande in the Bordeaux wine region. We are passionate about making excellent wines of the terroir, to achieve this we farm organically, avoiding chemical short cuts like weedkiller. All our wines are vegan and vegetarian friendly. We do all the work ourselves, from the pruning and ploughing, to the harvest, wine making and onsite bottling. We make two red wines (oaked and unoaked), a dry white, a rose and from time to time a sweet white wine. Since our first vintage in 2007 we are proud to have won 13 medals from prestigious competitions such as the International Wine Challenge and Decanter World Wine Awards. Our wines are in the appellation Sainte-Foy Cotes de Bordeaux. We, Paul and Kirstie Rowbotham and our son Benjamin, moved here in August 2006 from North Yorkshire. Our second son, Jacques was born here in France in July 2007. Read our story.